Although a biogas plant/ an anaerobic digestion plant is a 200 years old technology, it is getting popular recently because of its ability to generate biogas, an alternative fuel. One of the most advantageous point of this system is its ability to produce energy from waste products such as sewage sludge, agricultural residues, food wastes and different industrial and municipal waste products. More over, it not only creates valuable energy products at the end but also treat or sanitize those wastes for safe disposal. Different wastes are suitable as a feedstock for a biogas plant. But the feedstocks should be chosen based on their availability, quality and quantity. Also, if multiple wastes are digested together then different criteria should also be considered before co-digestion. For multiple wastes, multiple wastes multiple receiving and storage may require. For example, for liquid wastes like FOG (Fat, Oil and Grease) a heated tank is required while for solid and semi-solid wastes concrete basin or stainless steel pits should be preferable. Also, transporting and receiving feedstocks at the plant should be considered. In addition, some feedstocks need additional treatment like grinding, chopping, sorting, pasteurizing, hydrolyzing etc. So, adequate pre-treatment technology should also be considered if preferable and affordable. 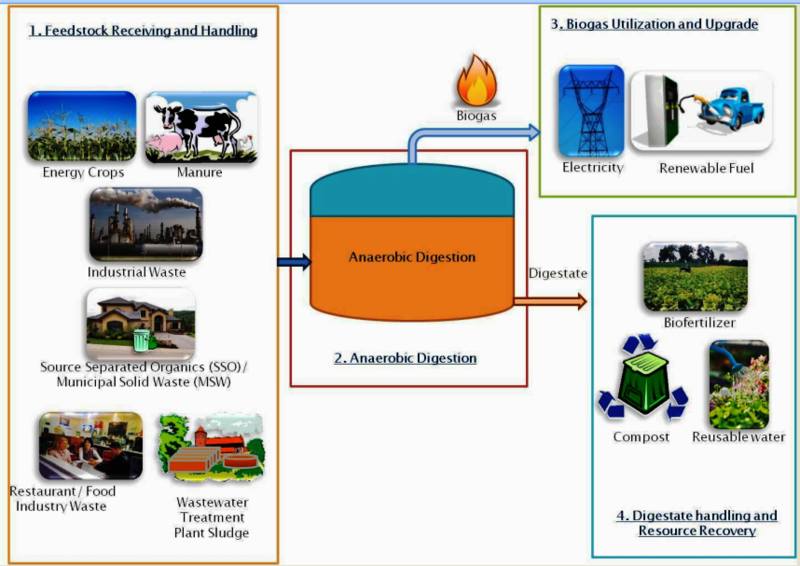 For designing a biogas plant different important anaerobic digestion process parameters should be considered. Also for running an anaerobic digestion plant temperature is an important issue which should also be decided. There are various anaerobic digestion types and technology available and based on the feedstocks type the most suitable one should be chosen. There are different shapes of anaerobic digestion tanks available. Most common shape for anaerobic digestion tanks is cylindrical (for United States it is shallow and cylindrical one). The egg-shaped digester is more recent one – mostly adopted in Germany and growing popularity in the United States. Digester tank mixing is also an important issue. Digester mixing System can be divided into tree categories - Gas injection mixing, mechanical mixing and Pump Mixing. Currently mechanical and pump mixing are most common and preferable ones. Other auxiliary equipment for biogas safety and handling are gas safety equipment like Pressure relief valves, vacuum relief valves, flame traps and automatic safety shutoff valves etc. ; gas monitoring equipment or gas meters and a waste gas flare. The detailed of digestate handling and resource recovery are detailed in this page. Applicable planning and construction laws, waste permit etc. Warranties, after sale care, training and maintenance etc. More information on planning an anaerobic digestion plant!